Every year at Thanksgiving, I am thankful for many things, with my lovely wife and two amazing daughters at the top of the list. My new job cracks the top five this year, although it might appear as though my intense love of this blog is suffering as a result. As I've said before, you, the readers out there in the world, are also people for whom I am thankful. Mahalo, as they say in my childhood home, for visiting often. Posts have been few and far between, I realize, this fall. Nonetheless, I wanted to celebrate the holiday with this post from Thanksgiving 2010, slightly edited, which appeared here. For those of you just tuning in, check the pre-post here, which includes all the Thanksgiving flash designed for the occasion. I asked readers to vote on which tattoo to get, and this one sneaked out a narrow victory over the traditional Native American profile. I like this design because it combines a lot of traditional tattoo elements and delivers an image with a sociopolitical subtext. We have the traditional American flag and handshake designs, but the added element of crossed fingers serves as a reminder that, despite apparent good intentions, there was subsequently a historical betrayal of that initial good will. But that's just one perspective, of course, and the Thanksgiving holiday focuses on the positive in our society. The mere existence of the tattoo reminds me to be thankful, which I alluded to in my original post. I was fortunate enough to have BJ as my artist again. He had inked my Friday the 13th tattoo last August, and I appreciate that he works quickly and concisely. It was nice, also, that this design was one of his contributions to the flash sheet, as he was kind enough to embellish slightly on the original design, and it always seems better when an artist is tattooing his or her own design. As for the idea behind it, he was trying to represent graphically a broken treaty. I'm extremely pleased with the end result. I want to thank all of the readers who voted for designs, and for everyone who reads and supports the site. 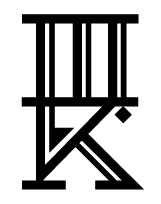 This entry is ©2013, 2011, 2010 Tattoosday. Last Sunday, I met a guy named Jeff at my local laundromat, where I happen to meet a lot of the contributors to Tattoosday, it seems. 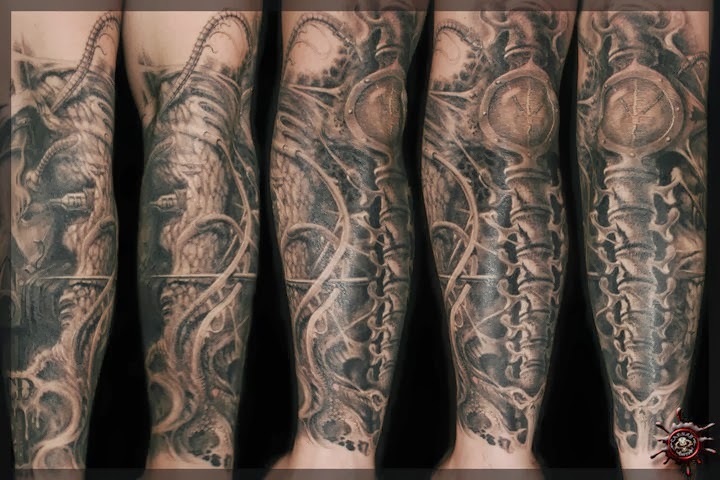 Jeff has a ton of work, including neck tattoos and some amazing black and gray sleeves. Turns out tattoos were created by Caesar, an amazing artist who works out of New York City. Unfortunately, these photos really don't do the work justice, but I was able to find some of the work on his Facebook page here. 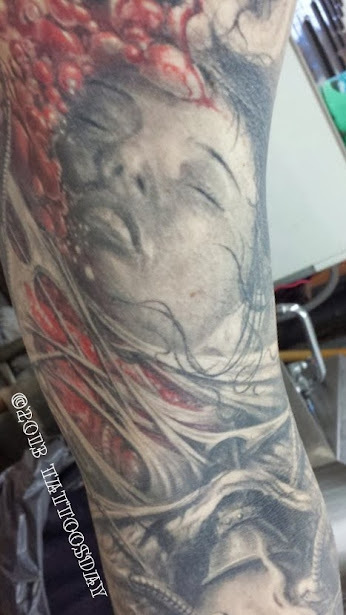 You can check out more of this amazing artist's portfolio at Caesar Tattoo in Manhattan's East Village. Our friends at Needles & Sins ran a short profile of Caesar here. Jeff even told me that some of his work has ended up in one of Marisa Kakoulas' black and gray tattoo compendia. You can see an even more extensive collection of Caesar's work on his Facebook page here. 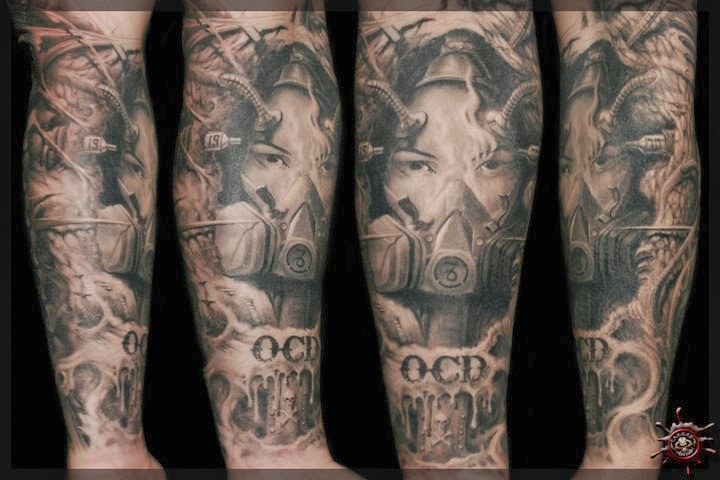 Thanks to Jeff for sharing his work with us here on Tattoosday! When Tattoosday was but a wee little blog, with big hopes and dreams, one of the early champions and supporters was my friend, Tom. Five years ago today, he died suddenly and tragically. I still miss him. 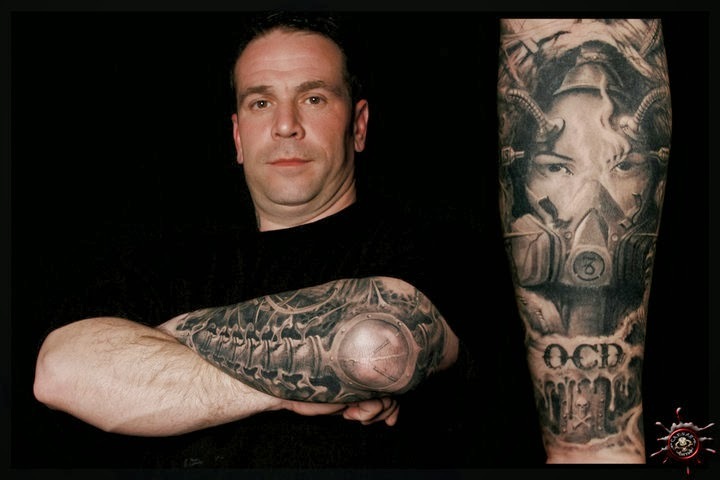 Although the memories fade, his spirit still lives on in the pages of Tattoosday. 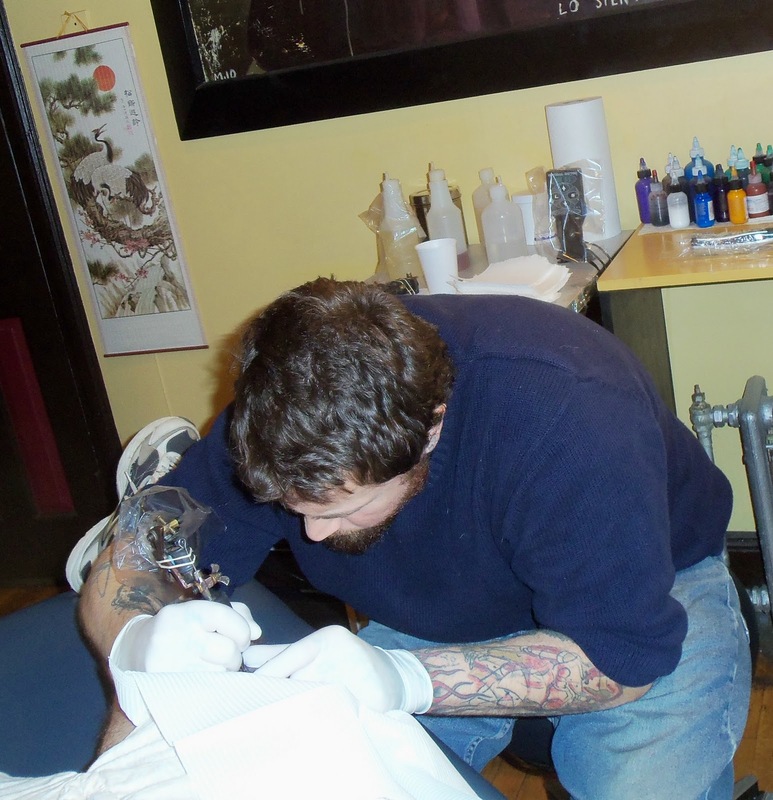 "This is the sole tattoo of my friend and co-worker, Tom. This is Tom's only tattoo and he has no plans to get more. He is proud of the fact that, because he designed it and because he then tore up the original design, it is a one-of-a-kind piece. He said that it was very painful because of the amount of black ink that went into it. 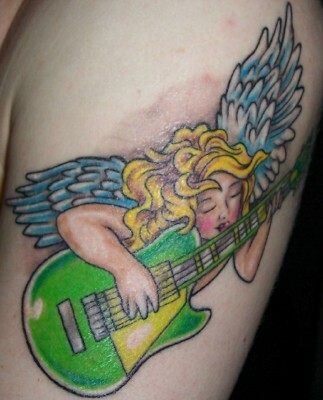 Thinking of you, Tom, I still miss you, and Tattoosday misses you too. 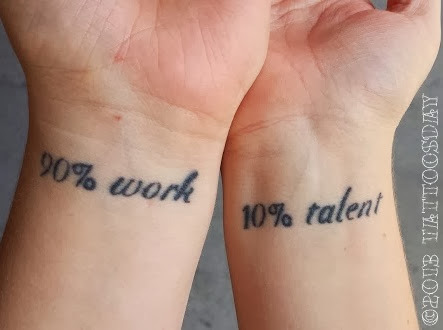 Her wrists state "90% Work - 10% Talent." "I had a teacher ... his recipe for success was that, if you work at anything, you can become good. It's your talent that will make you great. You can't rely on your talent alone - talent's only 10% of that equation." She got this at a vegan tattoo shop in Portland, Oregon called Scapegoat Tattoo. Thanks to Darcy for sharing these words of wisdom with us here on Tattoosday!